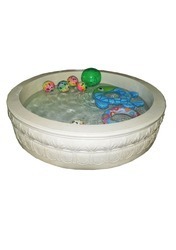 We are a leading Manufacturer of kids swimming pool tank from Bhilai, India. Product Description:Waahkart Kids Swimming Pool will provide your family with a whole lot of fun. It is a compact swimming pool that will fit into any garden. This compact swimming pool by Waahkart is great fun. A valve is fitted at the bottom of the pool so that it can be emptied easily. Unique sidewall construction. This is an unique manufacture of waahkart. It’s an unbreakable and Weather resistant. You can place it in your garden It will not cause any effect from any weather, Not only kids but also their parents can enjoy it with their kids. Looking for Kids Swimming Pool ?